With apologies to Rolling Rains readers in Malaysia, Turkey, Costa Rica, Argentina, and other non-English speaking countries like Australia, here is a "geek vocabulary test". If you understand this poem without clicking on the links you speak "Web 2.0"
Now, Web 2.0 is the name given to a wave of current generation interactive web tools that may or may not yet be universally designed. Fortunately, many Web 2.0 developers are very aware of UD and inclusive usability. Maybe there is something in this literary tour of the web that may be helpful to you as a traveler. Continue reading Web 2.0 and Nursery Rhymes. 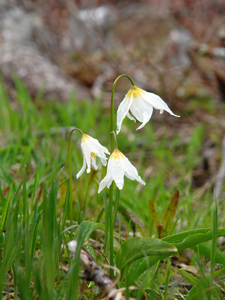 Outfacing Erythronium on Mount Baker. 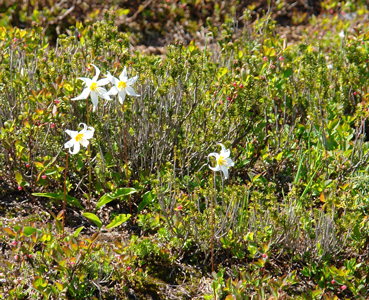 Downfacing Erythronim on Mount Rainier. Continue reading A June Floral Tour of the Pacific Northwest. ...Ok, only once today that is -- Universal Design means profits for those who apply its seven principles. Or look at Matsushita (Panasonic) profits. Universal design is something they are taking to the bank. So, what do active folks with disabilities do when they are not sprinting around the world on cruises, business trips, or living ex-patriot lives? Continue reading Life Between Travels. Looking for an Accessible Cruise Cabin? There is an informative ongoing discussion on cabin access on cruise ships at Cruise Critic. You can find it here. Continue reading Looking for an Accessible Cruise Cabin?. Japan is well-know for its Universal design infrastructure, products, and architecture. They want to be certain that their global suppliers are equally well-versed in the approach. Some readers wanted more bear photos. Having "risked my life" for the sake of photojournalism here is mother bear overseeing her inquisitive twins. Continue reading More on Mt Baker, Washington. The Disability Rights Education and Defense Fund (DREDF) is circulating the following announcement of proposed ADA regulations in the US. They are open for public comment. Continue reading The Public Transit/Tourist Moblity Nexus. Quando você escutar no aeroporto aquela vozinha estridente anunciar dos alto-falantes "priorizamos o embarque de passageiros com dificuldades de locomo? ?o", n?o liga, n?o, nem fique com ciúmes, é charminho do pessoal do solo, brincadeirinha, trechos de uma sátira. Já há um tempo n?o embarcam mais os apelidados de prioridade antes dos demais. Vamos juntos com a boiada. Continue reading Estolamos by Marcelo Rubens Paiva. 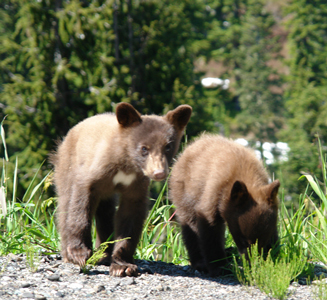 Momma bear had a close eye on the twins as they peered at the human being rolling past today on Mt Baker at the northern end of the Cascade Mountains in Washington state. The Points of Light Foundation coordinates local & national volunteer initiatives in the US. The 2006 conference was held in Seattle. Inclusion was one of the themes running through the week. The National Service Inclusion Project made several presntations. The topic of inclusion was raised in disaster preparedness workshops. Ability Awareness was there to let everyone know about Universal Design, Visitability, and service through its Ability House project. Continue reading Points of Light Foundation Conference. "The people who come here are going to want different amenities than they did in 1985," said Ken Buehler, executive director of the Lake Superior Railroad Museum at the Depot. "People are going to expect handicapped-accessible restrooms and warm areas after deboarding. I hate to say it, but the back of the Depot looks like the back of the Depot. We want to make sure it looks nice and is welcoming." Continue reading Amen to That!. Mt Rainier Inn has an accessible entrance. Narada Falls is best seen from the road due to inaccessibility. Further up the road Paradise offers a vista of the alpine surroundings and an accessible restaurant. As at Crater Lake there is lots of reconstruction going on this summer. The lodge at Paradise is undergoing major renovation. Continue reading Mt Rainier National Park. Look out from Route 90 along Cayuga Lake in Upstate New York and you won't see the magnificent retirement home that Linda martin has spent years designingand construction there. That's because it's five feet underground! By the way, the area is such a wonderful place - even above ground - that my wife and I started our honeymoon there. The Martin's are fortunate to own their little piece of heaven and we are all fortunate that they are maintaining it as an organically cultivated refuge. The Marriott Courtyard Linz advertises acceptance of service animals for guests with disabilities. I wonder if they have heard of the concept of "zero order" items. This is a non-starter as a feature folks. We expect running water, heat, and electricity too. Adam Phillips, in Disability Services Help Others, Too, starts out with the obligatory warming up exercise where America pats itself on the back for the ADA. He goes on to offer a slight grace note about "universal design." In fact, the disabled and the "able" are connected in deeper ways than are usually assumed, says Susan Squire, a professor who incorporates disability studies into her literature and women's studies classes. "The assumption that disability is one section of the population and ability is the other is ridiculous," she says. "All of us shift all the time in and out of different modes of ability and disability. Throughout life we need other people's help many times. The fantasy of independence is just a fantasy!" On the other hand, says Michael Berube, nobody in the disability rights movement marches under the banner "more dependence." "It was always a movement about creating greater independence for people with disabilities," he says. "This is a conundrum. We all need an extraordinary amount of help to become independent to differing degrees. We reach some kind of independence in some areas of our lives and not in others. But none of us get there by ourselves. Everyone requires some measure of 'reasonable accommodation." Continue reading Voice of America Enunciates Universal Design. The deadline to submit Proposal Abstracts for NineSigma RFP 30421-04-17, "Application of Universal Design Concepts to Automotive Design" is this Friday, June 23, 2006. The RFP and associated documents can be accessed online at http://www.ninesigma.com/mx/30421-04-17. To receive our newsletter that lists all active projects, register online at http://www.ninesigma.com/registration_form. One of the towns at the base of Mt. Rainier is Elbe, Washington. A fun place to stop for a meal is the Mt. 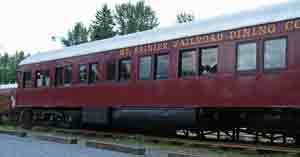 Rainier Railroad Restaurant. Right next door a whole caravan of cabooses make up the Hobo Inn. The restaurant is accessible by ramp. The cabooses did not appear to be. Continue reading Out to Lunch. Westward Expansion was the phenomenon of settling the western United States -- and a major emphasis in the grade school curriculum of the educated in these western states. The Oregon Trail played a central role int heat era. 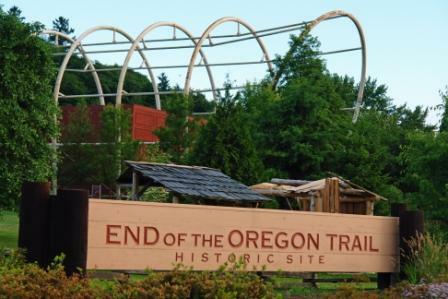 Here is a park just outside Portland, Oregon dedicated to that piece of history. "Rascals" is the name of a booming computer support group by and for seniors in this charming town along the Rogue River. As a river runs through it the town has at least the start of Venice's alternate transportation system - but you might find a gondola's performance not to your liking in the white water. Kayaking is the sport here. In town on business I flagged down a fellow in a three wheeled scooter navigating the surprisingly congested downtown maze. After checking in with various social service and voluteer groups like RSVP (Retired Senior Volunteer Program), and those savvy Rascals, I followed a lead on a residential development incorporating Universal Design. Continue reading Grant's Pass, Oregon. This is not the classic shot of the lake and its distinctive cinder cone island. 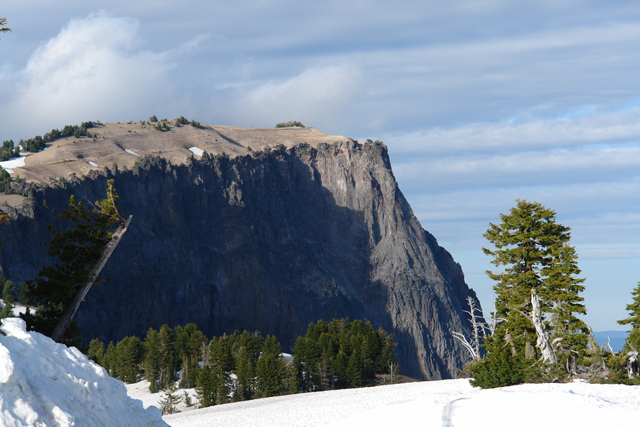 Today the caldera walls and sweeping snowfields seemed especially photogenic. Continue reading Crater Lake, Oregon. The enquiry has been conducted on a sample of Italian households consisting in 9,041 units, not including all those individuals living in charitable organisations. The CATI (Computer Assisted Telephonic Interview) technique was adopted for the interviews, which were carried out by telephone. The study represents a first attempt to fill in the current information gaps and, simultaneously, to build a methodological prototype capable of allowing surveys and analyses to be carried out on the real and potential demand for accessible tourism, even in other contexts. Continue reading 1999 Italian Study on Accessible Tourism. Continue reading Kirsten Lyttle Makes the News. Yes, but I Need a Roll-Out Shower, Too! The Oakridge Inn Best Western Hotel has excellent wireless internet for guests and that's just the start of the service I received there. Tamie, the manager, popped out of the office (slippers and all) so that I wouldn't have to unload the wheelchair and come in to check room availability. I was in luck. This ample non-smoking room was open. Continue reading Yes, but I Need a Roll-Out Shower, Too!. 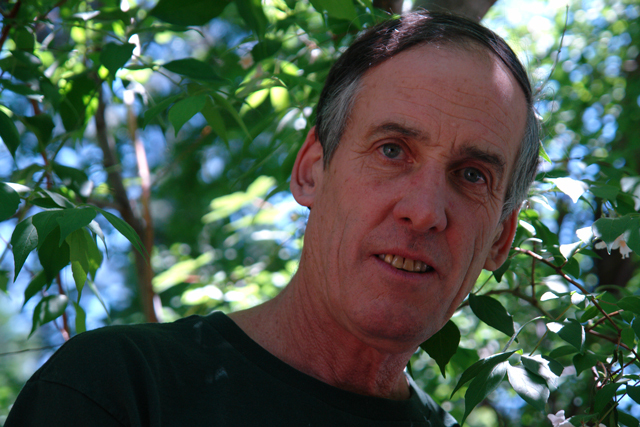 Robert Menzies is an ethnobotanist. His specialty is psychopharmodynamics. Iif you needed confirmation that he has a sense of humor look no farther than the fact that he has chosen to live in Weed, California. Yes, there really is a town named Weed. It sits at the base of Mount Shasta looking up at the mountain's snow covered top to the east -- wi th its occassional lenticular cloud looking like a jauntily place tam cap. Continue reading Meet Robert Menzies,TAB. Denis Anson graduated from the University of Washington in 1980 with a bachelor's degree of occupational therapy. In 1983, he received a Master of Science in Occupational Therapy from the University of Washington. He worked in adult physical disabilities for six years, and was a lecturer in the Division of Occupational Therapy at the University of Washington, Seattle, Washington for nine years. In August, 1997, he became an Assistant Professor at College Misericordia in Dallas, Pennsylvania. In June, 2004, he was appointed Director of Research and Development of the Assistive Technology Research Institute. He specializes in computerand assistive technologies -- but he has an eye for the retrograde as his "ADA Hall of Shame" documents. Continue reading Meet Dennis Anson. Jack wears the unmistakabe four-pointed bindi of those who have suffered excruciating pain. I lost concenration as soon as I saw the four scars in his forehead. He was checking me into his Comfort Inn in Eureka, California but I wanted to know his story. If you have been around the disability community long enough you learn to recognize the marks from the screws set into the skull for holding a "halo" traction device. Continue reading The Man with the Halo in Eureka, California. The Yurok people have a distinction not many can claim. 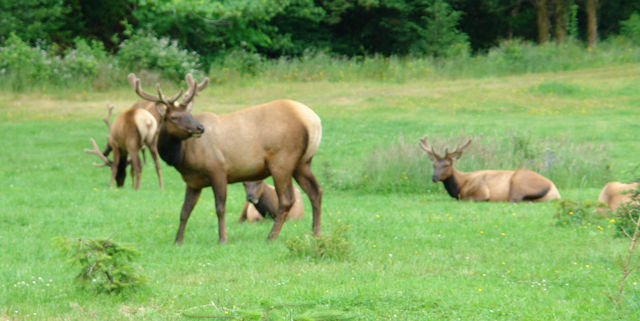 Frequently someone will find huge Roosevelt elk in front of their homes! My travels have been taking me all around Indian Country this year. Today was along the Klamath River in California and the home of the home of the Yurok. If anyone had asked, I suppose I could have told them, "Rekw-woy kee nue hey-gok" ( I'm going to Requa.) 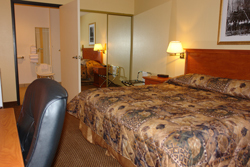 The hisoric Requa hotel is visible right off Highway 101 and offers a spectacular hillside view of the mouth of the Klamath River. On closer inspection I found no invitation built into into this inviting-looking place -- there were stairs in front and no apparent ramp or appropriate parking. Exclusion by design is a life limiting reality. Disabetes, and thus wheelchair use or amputation, has as a high incidence in Indian Country. Even to capture local tourism and dining customers, or to provide employment opportunities the travel & hospitality industry needs inclusion. Continue reading The Yurok Tribe. Deep in the Colombian mountains lives a coffee farmer named Juan Valdez -- not! National Public Radio had an interview with David Altschul president of the branding consultancy firm, Character, in Portland, Oregon. Altschul's comments on brand integrity could equally relate to public education about Universal Design as a concept. A few boundaries are blurring. People are confusing Universal Design with accessible design; substituting feature checklists for the seven defining principles; setting up false distinctions. Continue reading Branding Universal Design. Building this aggregator site on Universal Design and travel site was a quick diversion during a slow spell one day but I've watched it rise from site number ten thousand and something up around #70. Self publishing made easy. Fukuoka Citymight not be the first place that springs to mind when you thhink of public transportation systems. Apparentlty it was for Kuwait's ambassador to Japan, Ghassan Al-Zawawi. “This subway line is showcases state-of-the-art technologies and facilities that ensure full accessibility for everyone, including disabled people, the elderly, pregnant women and children,” said Dr. Masaru Sato, a professor at Kyushu University, who presided over the Design Committee’s meetings for the subway. All stations are equipped with elevators with easy passage, ticketing machines at low height, double handrails, guide maps with audio response system and Braille tiles. There are spacious toilets tailored for wheelchair users, seriously handicapped persons and mother with infants. “With the world’s most advanced technologies and systems that this subway has provided, disabled and senior citizens can travel in a relaxed and comfortable way,” Dr. Sato told Al-Zawawi. Continue reading The Cutting Edge is Not in the USA. Ikea is not promoting Universal Design in these three vignettes on living in a small space but they could become a starting point for some creative thinking about how to apply the seven principles of Unversal Design to built space. So this article by Janet Majure and Neil Salkind is for the "Cuccia" and other resort landlords hoping to incorporate Universal Design. Almost 60 million Americans have some type of disability that limits their physical activity. And, millions of baby boomers will need a more barrier-free environment in the next 20 years. But even serious physical limitations need not prevent participation in cooking and other kitchen activities. Only a few days ago I posted on Lessons Not Learned from Katrina. No claim as to cause & effect but it does look like someone has initiated some remedial education for slow learners in disaster services administration. Read the call by the Red Cross for disaster services specialists who can speak to the needs of the various disability communities. See below the call for participants in focus groups on disaster preparedness. Continue reading Provide Input into Emergency Preparedness Education. EAST LANSING, Mich. – An international packaging conference this month will explore how little things can become major obstacles. Michigan State University’s School of Packaging is organizing Universal Package ’06 – a look at design and packaging and how it regards – or disregards – a range of abilities, behaviors, habits and sizes. The conference will be June 19-22 at MSU’s Henry Center for Executive Development. Continue reading Michigan State University Takes on Wrap Rage with Universal Design. Below is an announcement from the Red Cross seeking qualified individuals to work with persons with disabilities during emergencies and disasters. Continue reading Put Your Universal Design Knowledge to Work. I am told that I have a "twang" when I try to speak Blackfeet -- and I only know one word, "Oki." It means "hello" as in "Oki Niksokowa" ("Hello my relatives.") Somehow when my friend since gradeschool and Boy Scout days, Alex Gladstone, pronounces the two syllable word it takes about three times longer than in my staccatto urban gringo version! Although the chances that I will attend North American Indian Days at the Blackfeet Nation this July 6 - 9 are slim I thought that Rolling Rains Readers may want to know about the event and nation residing in and around beautiful Glacier National Park. 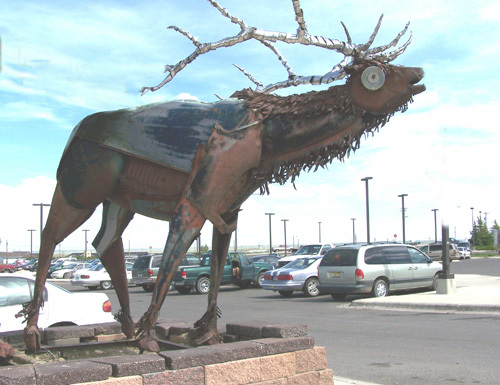 Continue reading North American Indian Days at the Blackfeet Nation. Tim Leffel's destination report on Romania does not detail the country's efforts to attract travelers with disabilities but it is an interesting piece to start with when considering an little known destination. Eleanor Smith of Concrete Change and Roberta Null of Common Place Design will be featured at the Morten Kesten Summit during the Universal Design and Visitability: From Accessibility to Zoning a conference next month at Ohio Stae University. 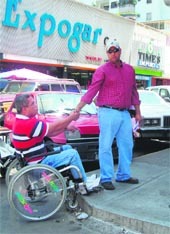 The topic at Rolling Rains is often Universal Design for persons of various differing abilities. Here is a chance to participate in experiencing design by people with a range of visual abilities. Continue reading Call for Artists. Trang web cá cược trực tuyếnAvis: They Tried Harder! PARSIPPANY, N.J., June 6 /PRNewswire/ -- Avis Rent A Car System, LLC today announced a new pilot program that will give customers the ability to rent a mobility scooter and have it waiting in the trunk of their next rental vehicle or delivered to the customer's location. Mobility scooters are four-wheeled, lightweight, battery-operated transportable units that are well suited for travelers up to 250lbs. The program rolls out at two of the nation's most frequented leisure and convention destinations -- Las Vegas and Orlando. Avis is the first rental car company to offer mobility scooters combined with vehicle rentals. Continue reading Avis: They Tried Harder!. Never Underestimate the Value of the "Ragged Edge"
Ed Eames, President and Joan Froling, Chairperson, of the International Association of Assistance Dog Partners add to the always thought-provoking conversations hosted by the Ragged Edge Online. IAADP and DOT: David and Goliath! contains valuable infomration for all travelers - and travel professionals - following the devolution of policy protecting travelers with companion animals. Continue reading Never Underestimate the Value of the "Ragged Edge". Freedom of the Seas is one big ship! The ship also features a six-person wheelchair accessible family stateroom (423 square feet with a 120 square foot balcony), featuring a curtained-off sleeping alcove with bunk beds, sleeper sofa, an accessible bathroom and shower, and accessible closets. Also, look for 10, six-person family oceanview staterooms; four, six-person promenade family staterooms and two, six-person inside family staterooms to make life on the high seas more enjoyable than ever. The proper ratio would have been inverted of course 18 wheelchair accessible staterooms with only one inaccessible cabin for those families that want the freedom to discriminate and have an ethical issue with Visitability. Continue reading Good News for Cruisers -- Freedom of the Wheels. Chuck Nyren writes, "Universal Design, originally developed for people with disabilities, has become a major player in the housing industry. " And, as we know, it is scoring with the travel and hospitality industry also -- but not yet as well covered in the media. But there is still a stigma attached. If not for the disabled, Universal Design is for old people – and Baby Boomers (at least according to popular myth) eschew anything that smacks of ‘old’ or ‘senior.’ For them, UD is patronizing, condescending – as if we’re babies again and in need of playpens so we won’t hurt ourselves or get into much trouble. Continue reading Chuck Nyren Chews on the Universal Design Concept. I know nothing of the etiology or treatement of Intermittent Explosive Disorder. We all knmow a little more about its prevalence after the recent study Harvard Medical School survey on IED. Will we now see Road Rage, Wrap Rage, and other species of temper tantrum analyzed down to the genetic level? Rather than travel too far down the neuro chemical route lt's look at environmental factors. In spite of the stereotype of the "angry crip" it has always been surprising to me, observing the disability community from the inside for more than 300 years, how patient people with disabilities are. So my suggestion for lowering the incidence of IED - even among those still temporarily not disabled - is Universal Design. Remove the obstacles. Decrease the frustration. Make human beings in all the "problem." In February 2005 the Jordan Times ran the article below on Inclusive Tourism efforts in Jordan. Continue reading Barrier Free Jordan - A Year Later. Casto Travel specializes in business travel. One testimonial on their web page includes a rave review by a customer from Ideo design - first rate folks. Good on Universal Design. Each morning I pull up to my parking space in front of Casto Travel in Santa Clara, California. 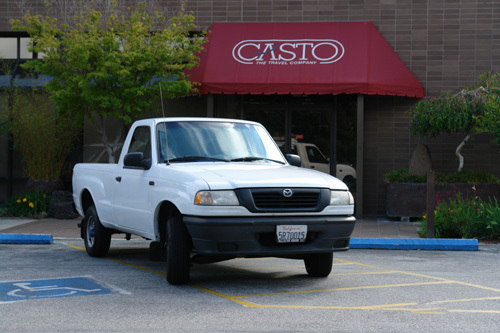 The other day an employee, let's call him "I'll only be here a minute," parked his pickup in the hashmarks between the two accessible parking spaces blocking both while ferrying supplies into Casto. With no particular effort at civility, I explained that it was not nice to do what he did. In fact, I pointed out that it could be rather expensive -- what with the parking ticket and all. I went on to share the insider tip that it was just plain stupid to purvey his peccadilloes on a travel writer. I am fair but I hold the travel industry to a high standard. First offense merits a verbal warning. Second earns the digital stocks & pillory. "Minute Man" was back again pickup posed jauntily for this "stock" photograph. He put in the extra effort to earn this 15 minutes of shame. Perhaps some in-house training is in order from Casto Travel's HR Department, Maryles? Those who followed the coverage of the Indian Ocean tsunami the the Rolling Rains Report know that an international network of Rolling Rains readers was formed to study previous disaster cases and communicate best practices to relief staff on the ground in the affected areas. Internationally known Universal Design specialists were generous without reserve in assuring that everything possible was done to see that devastated regions were provided with the technical support necessary to rebuild the damaged areas in ways that guaranteed inclusion. Continue reading Katrina: Lessons Never Learned. Travel to Maracay in Venezuela promises to become a little more hospitable for wheelchair users as the result of some local advocacy. You can find the whole story here (Spanish). Continue reading Buenas Noticias from Maracay, Venezuela. Continue reading The Seven Principles of Universal Design. While the country with the largest economic and military resources in the world continues to abdicate responsibility for its citizens with disabilities after Katrina, third world nations like Indonesia availa themselves of best practices in Universal Design to assure that rebuilding in the tourist sector is more inculsive than what preceeded it. The June issue of Road and Travel features a recent press release from the Open Doors Organization as an article. You will find the piece, America's Most Popular Cities for Disabled Travelers, here where it is filed as "...handicappedtravel.htm"
Continue reading Road & Travel Features Open Doors Organization. In New Jersey? Look up "BeachWheels"
Ed Heaton founded BreachWheels to make Long Beach Island a destination of choice for wheelchair users. While the author uses the word "handicapped' where "disabled" is meant and long-abandoned slights such as ""wheelchair-bound" and "confined to a wheelchair" appear this article in the Jerusalem Post, Getting Around profiles one person's work to provide accessible travel in the absence of full adoption of Universal Design. One would hope thatthe article's featured tour operator Daniel Steinberg is not prone to the patronizing mindset expressed in the author's poor choice of words. I am contacting you to make you aware of NineSigma Request # 30421-04-17, "Application of Universal Design Concepts to Automotive Design". Our client (General Motors Corporation) is seeking partners for the application of Universal Design concepts to automotive design. The submission date for Proposal Abstracts is June 23, 2006. The request and more information is available online at http://www.ninesigma.com/mx/30421-04-17. If you are interested in submitting a proposal or would like more information, please contact me directly. To receive our newsletter that lists all active projects, register online at http://www.ninesigma.com/registration_form. The call for papers just closed. Watch for some very informative presentations to be selected from the over 280 abstracts from 25 countries. After the 2004 Designing for the 21st Century III Conference while speaking at the Hamamatsu conference on Universal Design I was invited to organize a section in Kyoto on Inclusive Tourism. Unfortunately, I have a series of presentations scheduled that week including the SeniorNet 20th anniversary conference, Bentley College, and the 2006 AARP Life@50+ conference in Anaheim. Continue reading Kyoto Universal Design Conference. 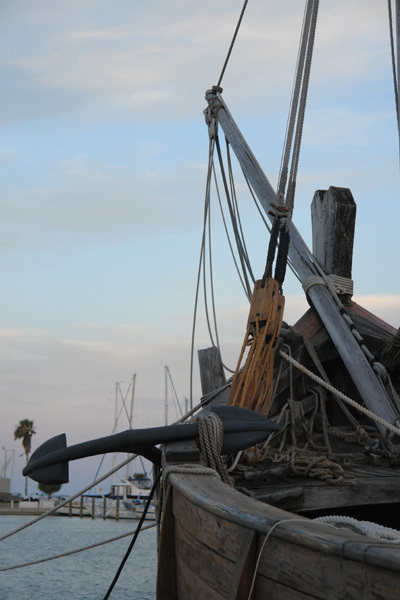 It wasn't really time travel but it was close the day I explored the Yacht Harbor in Corpus Christi, Texas. The multi-switchbacked ramp from the street to the piers looked formidable but was actually very well done and hardly strain at all. Seeing this reconstruction of Christopher Columbus' Nina made it worth the trip! Continue reading Nina, Pinta, and the Santa Maria. Head on over to Katya Stokely's Broken Clay Journal to watch the spread of the backlash against airline accessibility. Starting with Quantas' urban myth about luggage handlers injuring themselves by handling wheelchairs and certain European discount airlines taking up the retrograde banner the strategic front moved to Canada and continues to spread. Continue reading Katya is on to Something at Broken Clay Journal. Last July Michael Small, Senior Policy Officer, Disability Rights Unit, HREOC presented a paper entitled "Setting an Agenda for Disability and Tourism Research." The paper was part of an Australian national consultation on Inclusive Tourism. Here is a link to his presentation notes. Continue reading Human Rights and Inclusive Travel.